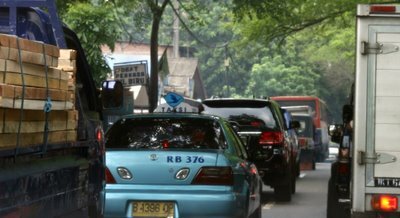 If you live in a city like Jakarta, you need to leave home early to avoid heavy traffic on your way to office or to drop your kids to school. Take me as an example. I usually wake up at about a quarter to five, and immediately go to the kids’ rooms to wake them up and ask them to take bath. As everyone wanted to stay at bed a little bit longer, to avoid further routine arguments we finally agreed for an arrangement: Ayu, the eldest, should take bath first on Monday, followed by Rangga and finally Wiwid the youngest. On Tuesday, Rangga should take his turn first followed by Wiwid and then Ayu, and so forth. As an incentive, the one who took bath first could occupy the front seat in the car. Since Ayu is now living at Depok near her school, there are two kids left. But still we always wake up at the same time, and leave home before six. That’s because the kids study at two different locations, and my office is located in “three-in-one” area, where I can only pass the street after 07.00 if I have another two passengers with me, but I don’t. Hence, I still need to rush to office after dropping Wiwid off, so I will be able to seat comfortably in my office before seven. During these years, at the times when I struggled with the heavy traffics, I found something interesting about car drivers’ behavior that might reflect their approach to life, career, etc. We live in Buaran Indah, east Jakarta. When all the kids studied at Labschool Rawamangun, about 7 KM from home, we used to pass a congested street named I Gusti Ngurah Rai. Public transportations, such as Metromini (medium-size bus with a strong orange color) and Mikrolet (smaller in size), stop frequently at the left lane to take passengers. There are also several locations where cars enter the main road from smaller streets that cause further traffic on the left lane. With that idea in mind, most people tend to take the right lane with the hope that they can drive faster, and not to be annoyed by Metromini or Mikrolet frequent stop. But strangely, cars using the right lane tend to move slower than those using the left one, as you can see from the first and the second picture. Why? One of the possibilities is that number of risk takers (RT) is much lower than and risk averse (RA) people. 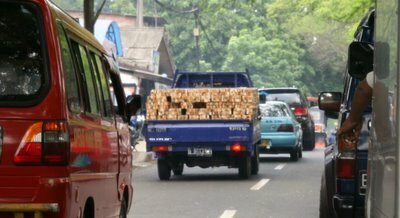 With significant numbers of RA cars on the right lane, there are always some empty spaces available on the left lane.But knowing that there’ll be risks for them to stop behind Metromini or Mikrolet, RA drivers tend to keep driving on the right lane, and don’t want to take chances to move to the left lane. RT drivers, on the other hand, tend to take chances. So they will quickly occupy the empty space on the left lane. When a Metromini makes a stop, they will try to quickly move to the right lane. Most of RA people are slow drivers, and are nice people, and hence they tend to let the RT drivers cut their way, only a few tough RA people will try to block the passage. That’s why the right lane traffic tends to be slower. Of course these things may not happen in other big cities, but hey, this is Jakarta. So, what about you? Do you usually take the right or the left one? Do you try to move ahead faster, or you are just happy to move ahead slow but sure. Are you risk taker or risk averse person? Which one is actually better? It depends. To me, it’s how you see it, and hence it’s a mind game. More important thing is whether you can enjoy it or not. If you enjoy the thrill by being risk taker, then live with it and play the game fairly. Meanwhile, it’s better not to upset people by cutting their way on your way to the top.